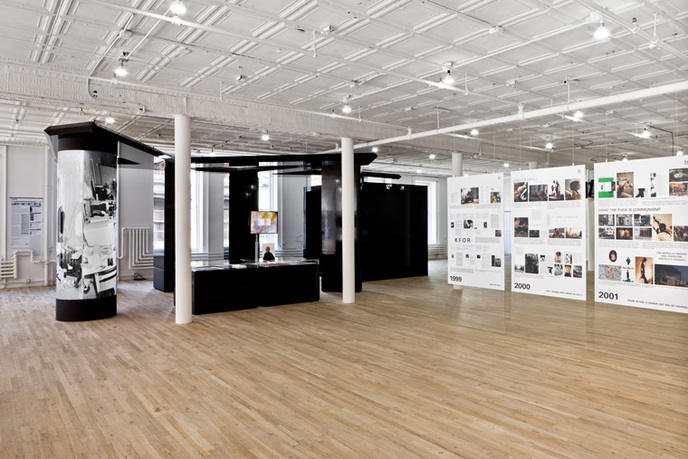 2013 | Artists Space, "Richard Hollis" and "Stephen Willats: 50 Years of Control Magazine"
2011 | Artists Space, "Identity"
Bernadette Corporation: 2000 Wasted Years, installation view, Artists Space, 2012, New York. Courtesy of Artists Space. 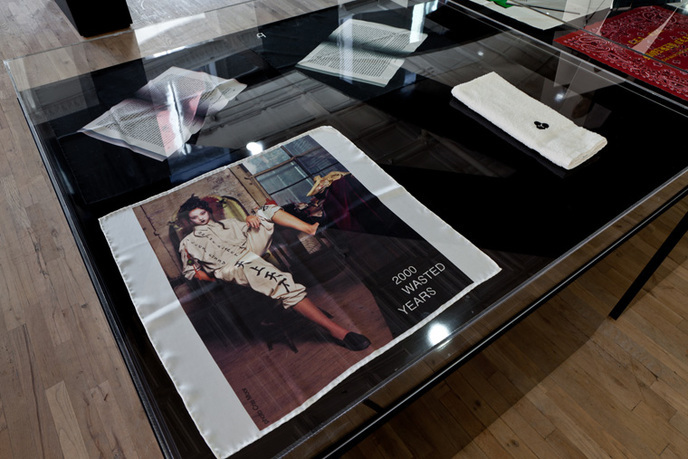 2000 Wasted Years is the first retrospective by Bernadette Corporation. Structured by a display architecture common to flagship stores, museum dioramas, and other immersive viewing environments, this exhibition recasts the works authored by BC since their inception in the early '90s. 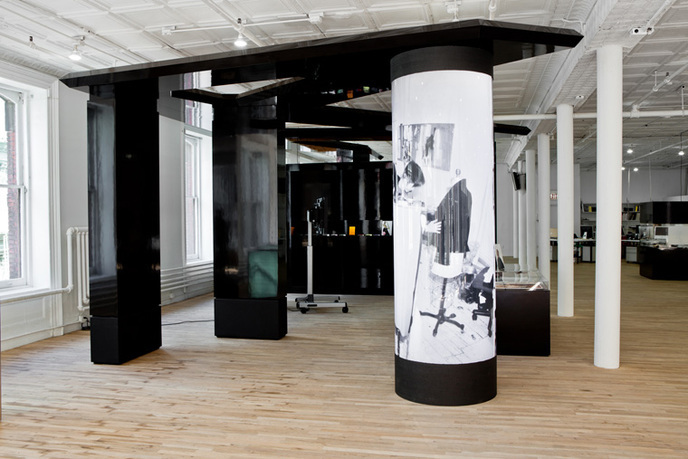 Beginning with the organization of parties in downtown New York, their mock incorporation and ambiguous branding strategies developed into a women's fashion line, engaging in quotation, provocation, hoaxes, and anti-artistic postures of crass commercialism. 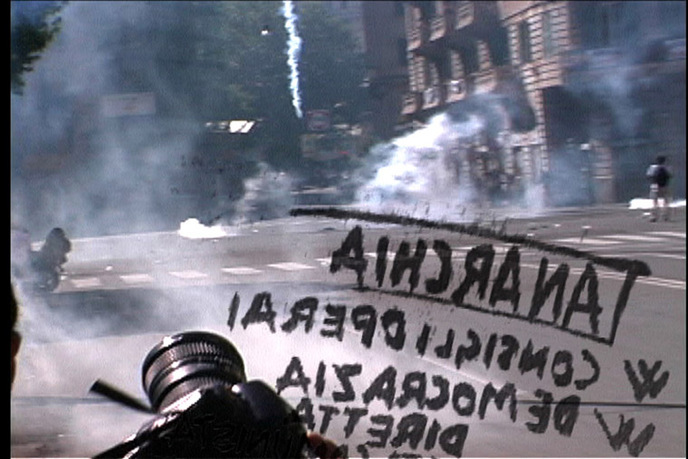 BC then turned to publishing, releasing three issues of the magazine Made in USA, followed by the film Get Rid of Yourself, revolving around the rioting and Black Bloc anarchists in Genoa during the 2001 G8 summit, along with scripted passages featuring Chloe Sevigny. Next came the novel Reena Spaulings whose "whatever" subjectivity was enacted by fusing up to 50 unnamed authors. The later Pedestrian Cinema project resulted in the "discovery" that cinema was dead; BC hid the corpse through a rush of ephemera that made its way into galleries in lieu of films. 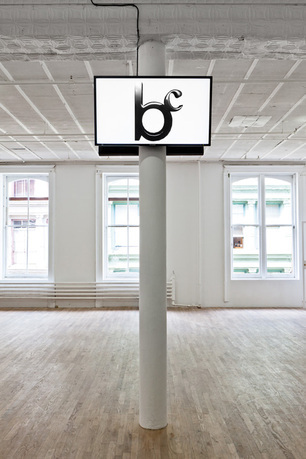 Now, their deceptive use of the gallery space lyrically and conceptually underscores the persistent "reality" of BC both as a group of relationships, and as brand. Bernadette Corporation is currently based in New York City as a collaborative with a shifting group of principle members. 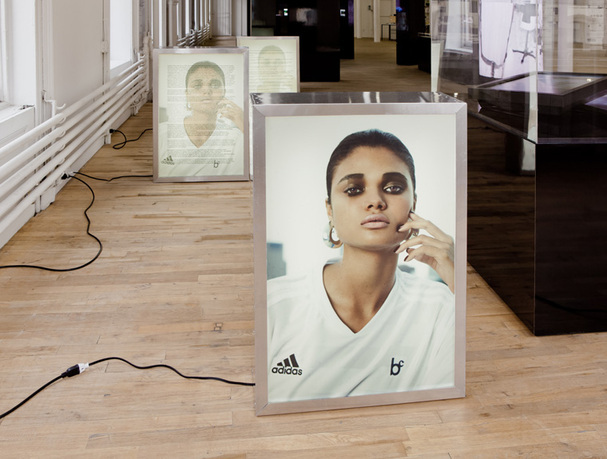 Solo exhibitions include ICA, London (2013); Artists Space, New York (2012); Galerie Meyer Kainer, Vienna (2011); Galerie Neu, Berlin (2010); Greene Naftali, New York (2009); Kunsthalle Zürich (2008); Künstlerhaus Stuttgart (2007); Witte de With, Rotterdam (2005); Galerie Meerrettich, Berlin (2003); and American Fine Arts, New York (1997). Group exhibitions include Nothing in the World But Youth, Turner Contemporary, Margate (2011); Not in Fashion: Photography and Fashion in the 90s, Museum für Moderne Kunst, Frankfurt (2010); 9 Screens, MoMA, New York (2010); Manifesta 7, Trentino-South Tyrol (2008); Cult of the Artist, Hamburger Banhof, Berlin (2008); Shandismus. Autorschaft als Genre, Wiener Secession, Vienna (2007); Make Your Own Life: Artists In and Out of Cologne, Institute of Contemporary Art, Philadelphia (2006); Whitney Biennial 2006, Day for Night, Whitney Museum of American Art, New York (2006); Populism, Stedelijk Museum, Amsterdam (2005); The Big Nothing, ICA, Philadelphia (2004); Ex-Argentina, Museum Ludwig, Cologne (2004); Let's Entertain, Walker Arts Center, Minneapolis (2000). Stefan Kalmár, executive director and curator at Artists Space, has held positions as director, Kunstverein München (2005–09); director, Institute of Visual Culture, Cambridge, UK (2000–05); and curator, Cubitt Gallery, London (1996–99). He has also curated the exhibitions The Secret Public: The last days of the British Underground, 1978–1988, cocurated with Michael Bracewell; Oh Girl, It is a Boy, cocurated with Henrik Oleson; and The Archive of Stephan Willats, cocurated with Emily Pethick. He has collaborated with several artists, including Allora & Calzadilla, Wolfgang Tillmans, Hilary Lloyd, and Duncan Campbell. Kalmár is the coeditor of Be Nice Share Everything Have Fun (Walther Koenig). Richard Birkett, curator at Artists Space, studied at Goldsmiths College in London before running Whitechapel Project Space for six years (2002–08), during which time he also organized projects as part of the Serpentine Gallery's public program. Between 2007 and 2010, he was curator at the Institute of Contemporary Arts (ICA) in London, where he organized the exhibitions Nought to Sixty, Talk Show, Calling Out Of Context, Billy Childish: Unknowable But Certain, and COSEY COMPLEX, among others. As part of Talk Show, he initiated and edited (with cocurator and designer Will Holder) the periodical ROLAND, which has become a regular feature of the ICA's program. New York's Artists Space is the only organization that conceives all of its programming guided by one principle: the relevance that it has to the artists living and working in New York. 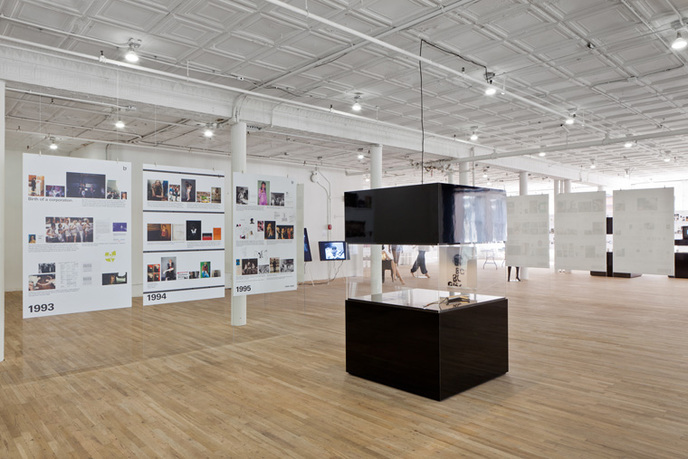 For over four decades Artists Space has led the debate in contemporary art by challenging the intellectual and artistic status quo in New York and beyond—lending support to emerging ideas and emerging artists alike.